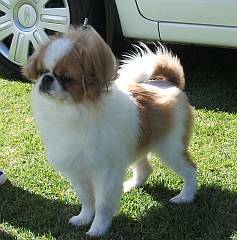 The breed originates in Japan, though similar dogs originated in China. In Japan, the little dogs were kept by royalty and were very valuable. Occasionally they were given as gifts to important visitors from overseas, but many died on the long journeys by sailing ship. Gradually they spread over the world. They used to be known as the Japanese Spaniel. 'Chin' means 'like a cat'. They lick their paws and wash their faces. They also walk daintily like a cat, and like to climb up high on the furniture. 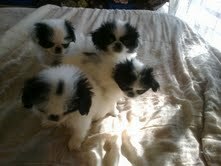 They have a flat face, like a Pekingese. The eyes are wide apart. 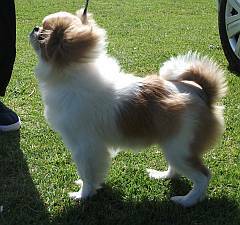 The coat is long and silky, and benefits from regular brushing. The hair is thick around the neck. The body has a square look. The ears are high on the head, falling forward. The tail is carried forward over the back. Chins make lovely, entertaining pets. Great for anyone wanting a small dog. There are a few breeders in South Africa, but they are not common yet. Colour: white and black, or red and white. The red includes all shades from the palest lemon through sable, orange to a deep brindle.